I wondered what I would do this evening after a day’s work. 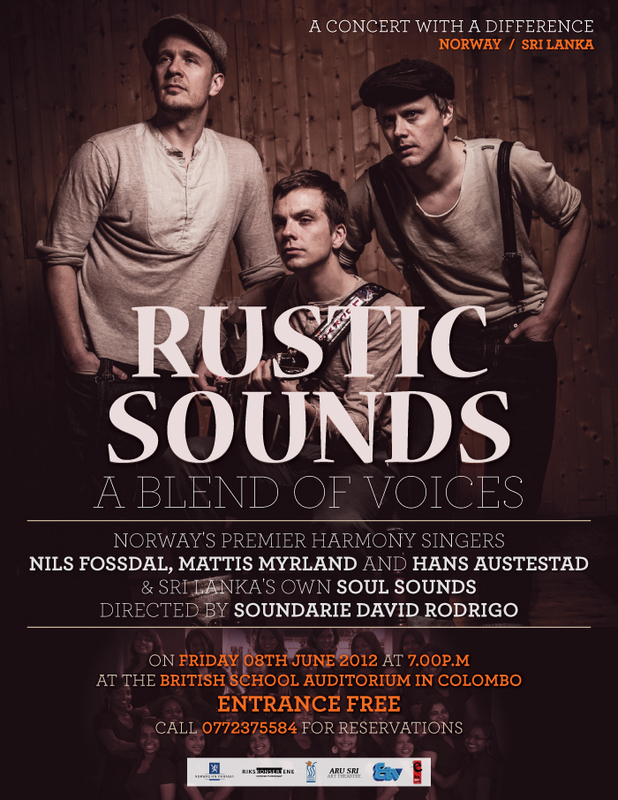 I opened my email at 5pm and had an invitation for a Norwegian musical evening at the British School by a Norwegian friend from the 60’s, Arne Fjortoft. I called him immediately at 5 and said I will come. I got the best seats!!! I did not have a vehicle to take me home to change and shower, so I walked over to the venue from my office about a hundred meters away and met a mutual friend and sat with him. I Chatted with Mano Chanmugam, who I had not met in decades, and exchanged pleasantries before settling in to an enchanting evening of music. I was hoping for some Norwegian folk songs from the three musicians but instead was treated more to their version of English language American country music, and then the soul sounds of Soundarie David Rodrigo really got it going with a selection of old well known soul music and sprinkling of pop music from her female choir of 20. 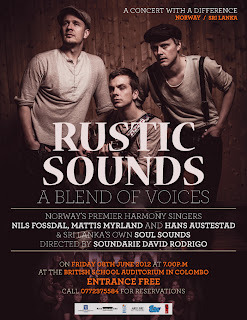 It was the first time I had heard them and was pleasantly surprised at their talent and they also sang together with the Norwegian trio for a while. Soon after, I went to the Norwegian Ambassador’s residence which is right opposite where I live. I was the only guest who lived so close to the cocktail party venue. I chatted with many I knew like Bhavani from CPA and Ismeth’s wife and many I introduced myself to who knew of me, like Sanjiv Gardiner and Jehan Mendis, a relative, Orania and Mohan’s son who I was introduced to by Bhavani and only then realized who he was as I had met his mom earlier when I was walked up the stairs to the show. Talked to artists, diplomats, and avoided the political types like KJ and Dayasiri, Sumathiran, Nimal Siripala and the NGO types like Jehan Perera, Pakiasothy and the Pafferel guy and a host of likeminded. Chatted with the host’s husband who was returning to Oslo in a week and the Ambsassador herself was leaving in a few weeks, after a record 6 years as deputy and then head. Her position will be filled by another lady. The food and wine was great, and I only sampled the cheeses at the end, before walking across the road, home about 10pm. The music was a three piece jazz type band to keep things humming along. These places sure do pack out with a motley collection, all talking nonsense. "avoided ... the NGO types like Jehan Perera, Pakiasothy"
If your friend works at CPA then Pakiasothi is her boss!! So much for avoiding the NGO types!! Well spotted. It was put there on purpose to see if anyone reads these! Anyway it had nothing to do with the NGO in my getting to know her and only later discovered her employer. However point taken. So I guess I must then ignore people I get to know from other avenues ha! I think your last sentence sums it all up. Well said! I think best you focused on the wine, cheese, music. Enjoy reading, I was going to post exactly the previous blog - " avoided.. the NGO types ... " !!! can you explain to your readers why food prices are supposedly so expensive in Sri Lanka? On the one hand, consumers are saying food is too expensive, and on the other hand producers are throwing their produce into the streets as they can't sell it. What's going on?????? Please articulate as soon as you can. One month and no updates? Are you out of material? Has Life got boring? -Your nation isn’t intelligent enough and / or educated enough on how to manure economic conditions so this doesn’t happen – so time to wake up and study day and night until you get it right. -Poor or non-existent food warehouses with necessary cooling facilities in magnitude. -Poor knowledge as to the best practices of on how to mass produce with genetic engineering. IE. Monsanto, Mossaic, DuPont, these companies are the master of genetic engineering food. -Too many holidays! Take your Poya days out of calendar as a Holiday. Reduce the number of government holidays and get your third world nation to work hard and intelligently. -Generate income into the country. Pick a valuable subject area, do R&D next 30-50 years and bring something into this world. Think about electricity, telephone, Air Planes, Gas, and Cancer medicines none of which Sri Lankans are the inventors of ! the reason why your nation is poor and still really not that useful to the world, at least not yet recognized in that way at all. I heard your country started a ‘car company’ . Trying to compete with Honda, Toyota, Nissan, and Mercedes ? Who do you think buy the cars ? Indians – no I don’t think so. Japanese – no they will laugh so loud in Tokyo and you will be able to hear it from Colombo. Instead, if you allocated that money to do R&D in pharmaceuticals and come out with a cure for 100s of cancers that the world is still struggling for would have been not only very lucrative but also will be of noble cause , but to think like that your decision makers need to be that much educated and they are not! – your main main main issue. -Fire your supreme Court and install one with only the candidate that have extensive degrees from abroad such as usa, uk, Canada and Germany. 1. Develop a nation wide freezer network. 2. Develop more nation wide food distribution networks – learn from the second world war – learn how we supported our troops around the world to stay strong daily, stay healthy daily, in order to save the world. If you do that then you will understand how the distribution network in one of the key or the key item in this puzzle. 3. Educate yourself as to what food genetic engineering is and implement it yesterday ! 4. Do not wait for the rains to fall. Rains will fall weather you wait for it or not. So, you also have a job to do. That is, develop myriad of water transporting systems via huge metal pipes and/or PVC into areas where there is no water. Don’t just depend on the lakes that were built by Vedda kings. You have to your part , so develop more and more water distributing systems into areas where there are thousands of acres not being used due to water shortage. What you have isn’t a water shortage , it is brain shortage is what your nation has, and no one can help that but you , just you alone! So, again dust your pants and pick them and start working hard, very hard. 5. Here is something I am going to explain you and try to see intelligence in it. If you can understand this then you are golden because that is the first step; Develop ‘competition’ in your country. The only way you can do that is with ‘free market’. Develop ‘free market ’every where in your country. The ‘free market’ concept allows and encourages people regardless of who they are , where they come from, which cast they are etc. work very hard. When you have figured out how to make people work very hard then that is the path to prosperity! And ‘free market’ is that key.